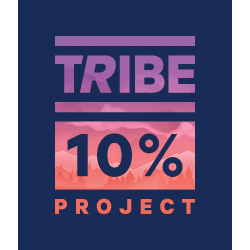 The TRIBE 10% Project book is a collection of truly inspiring personal journeys. Real TRIBE members telling stories about the training, nutrition and lifestyle changes that they made that have added up to 10%. TRIBE was inspired by a 1,000-mile run across Eastern Europe to fight human trafficking. We craved natural food to sustain us on that journey. So, we made it our mission to change the world of performance nutrition. We think about the 1,000 miles journey every day. The spirit of perseverance and the camaraderie of the runners inspires the TRIBE community in everything we do. We are not encouraging everyone to go on polar expeditions or run across continents. But we want to be fearless, to empower everyone to test their limits. of how we can perform better and therefore be happier. How can we optimise every aspect of our lifestyles to become the best version of ourselves? Everyday. That's why in 2018 we are launching the TRIBE 10% Project. We believe that small changes in nutrition, lifestyle and training can help us perform 10% better. The 10% Project is our challenge to each other - the TRIBE community - to improve and push our boundaries. Throughout 2018, there will be a series of running, cycling and other challenges to push us forwards. You against you. With the TRIBE community alongside you. Pushing you to go harder and further and faster. To be the best version of yourself. As part of the TRIBE 10% Project, we will be releasing a limited edition of Everyday Adventures. It is a collection of personal journeys that inspire us. Real TRIBE members telling stories about the changes that they made that have added up to 10%. All are actionable and realistic; from going vegan one day a week to taking on adventures to sleeping longer. No quick fixes. Let's make this the year of the small changes. That add up to a really big change. You will recieve a FREE TRIBE 10% Project Book in your TRIBE Pack! You can join a team of 300 TRIBE runners taking part in the Hackney Half Marathon as part of the TRIBE 10% Project here. Let's do this!